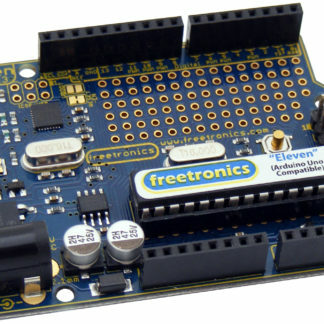 View cart “Eleven (100% Arduino Uno Compatible)” has been added to your cart. 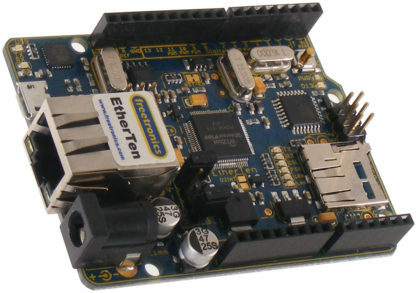 Two tastes that taste great together: Arduino and Ethernet. But until now the only way to connect an Arduino to the Internet via a LAN was to add an Ethernet Shield. 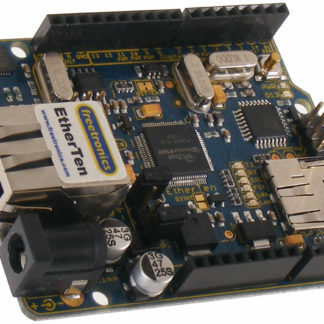 Wouldn’t it be great if there was an Arduino-compatible board with on-board Ethernet? This, folks, is what you’ve been waiting for. 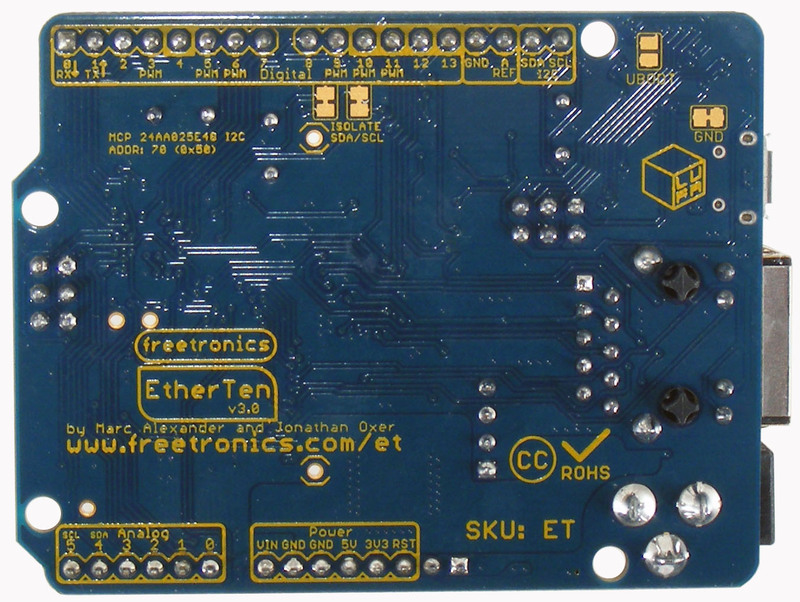 The EtherTen is a 100% Arduino compatible board that can talk to the world. Do Twitter updates automatically, serve web pages, connect to web services, display sensor data online, and control devices using a web browser. 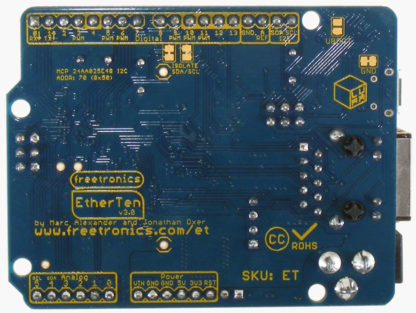 The Freetronics EtherTen uses the same ATmega328P as the Uno and the same Wiznet W5100 chip used by the official Arduino Ethernet Shield, so it’s 100% compatible with the Ethernet library and sketches. Any project you would previously have built with an Arduino and an Ethernet shield stacked together, you can now do all in a single, integrated board. We’ve even added a micro SD card slot so you can store web content on the card, or log data to it. 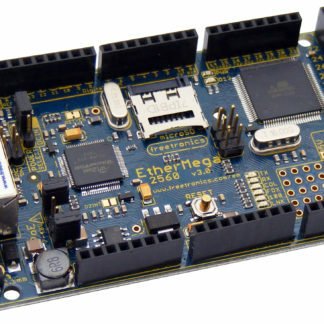 Fully compatible with standard Ethernet library and standard Arduino IDE. Ethernet activity indicators on the PCB and the jack. 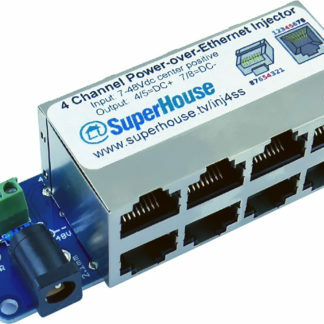 Optional Power-over-Ethernet support, both with DIY 7-12V injectors, PoE Regulator 24V, or full 802.3af standards-compliant. Micro-USB connector: no more shorts against shields from the USB jack! Please note that the Ethernet Jack can touch some wide shields. These can be raised up with Stackable Header Sets and we also have the ProtoShield Short which can sit beside it. 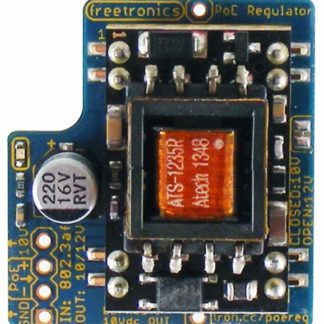 Reset management chip prevents brown-outs or other reset problems. Fixed SPI behavior on Ethernet chipset. High quality gold-plated PCB, clear part markings. 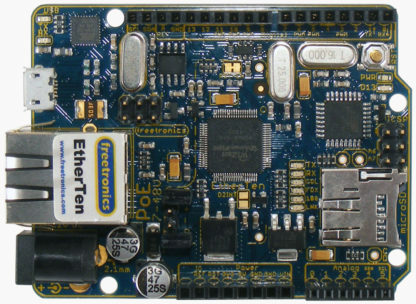 The EtherTen provides a number of options for different Power over Ethernet. You can use the supplied jumpers and feed 7-12Vdc down the wire for the simple DIY version, or you can fit a Power Regulator 28V and feed a bit more voltage down the wire, or you can use the PoE Regulator 802.3AF along with a proper commercial PoE injector or switch at 48V. It’s up to you.